I thought that the day's heavy rain earlier in the week would have brought the river up and coloured the water but it hadn't. If I'd known I'd have gone fishing sooner. As it was I decided to do a spot of spinning to see what I could catch on a lovely, sunny afternoon. Because of the low water levels each swim is very different and although I don't usually change lures much during a session this time I needed three changes to cover the options. I started off in a deepish pool with a strong, turbulent inflow. A soft plastic witha 7gm leadhead seemed about right and sure enough first cast I was into a reasonable perch. This was a good opportunity for me to try out the time delay on the camera which I failed to cope with when I had my big bass the other week. Sure enough I managed to get it to work but in the first picture I contrived to hide my face behind the fish (no bad thing you might say) and the second had too much contrast. Anyway I thought it was a reasonable first attempt. Several more casts and no more bites so I switched to a J11f Rapala. needless to say it didn't get down far enough in the deep water so, getting no bites I moved on downstream. A long cast into a pool below some gravelly shallows produced an excellent bite on the plug from a decent pike sitting just behind the lip of the pool but after a few seconds it came unstuck. I walked on further downstream to a wide gravelly shallow with overhanging trees on the far bank. 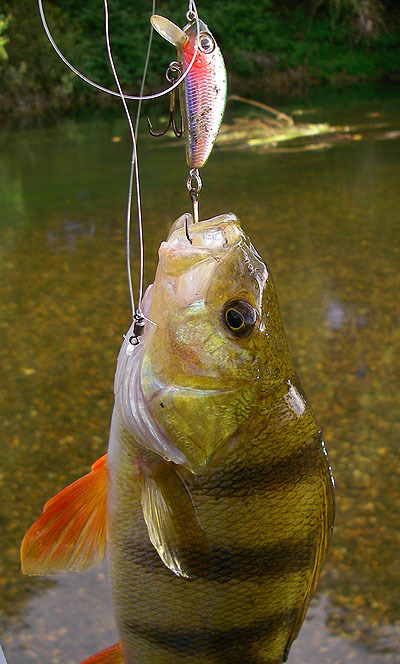 The Rapala worked beautifully just above the bottom in the shallow water and I had a few plucks and saw perch chasing after it. Clearly it was too big for them. I pitched the plug straight downstream along the near bank and there was a big swirl and a tug but again it wasn't hooked - 'big chub' I thought. 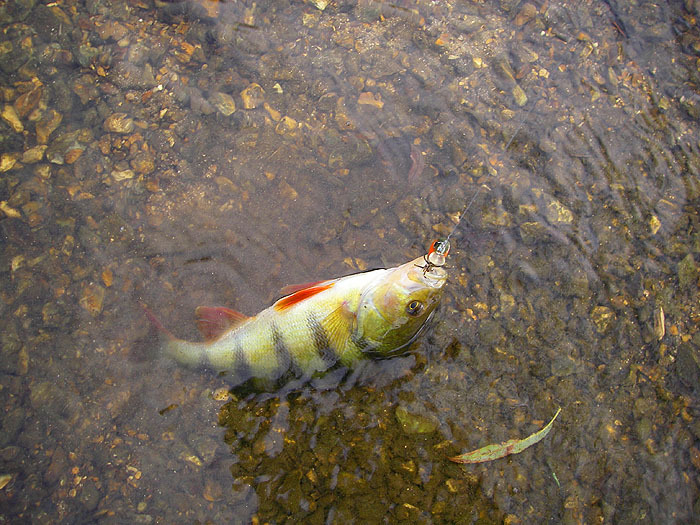 I changed the lure for a small slow-sinking plug about the size of a modest minnow. To be honest the hooks on this one are a bit big and occasionally the front one fouls the lip or the two of them lock together - this can be a real nuisance if you've just made a superb cast to the 'perfect spot'(must get hold of some smaller 4x trebles). 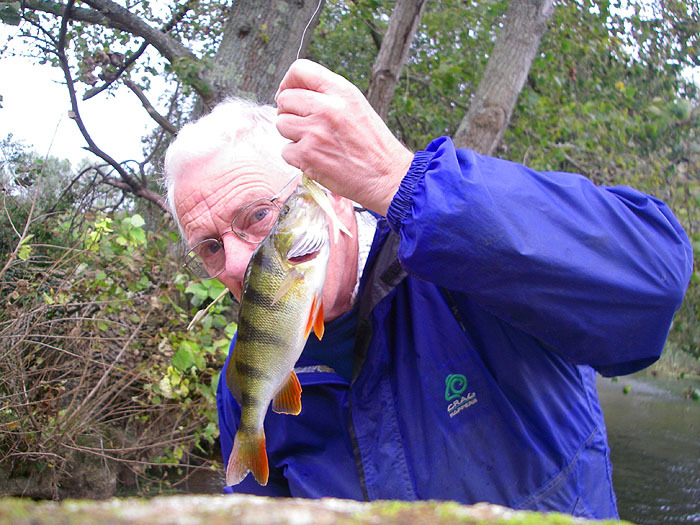 Anyway the change of lure sort of worked and I hooked and landed a few perch but there was no further sign of the chub. 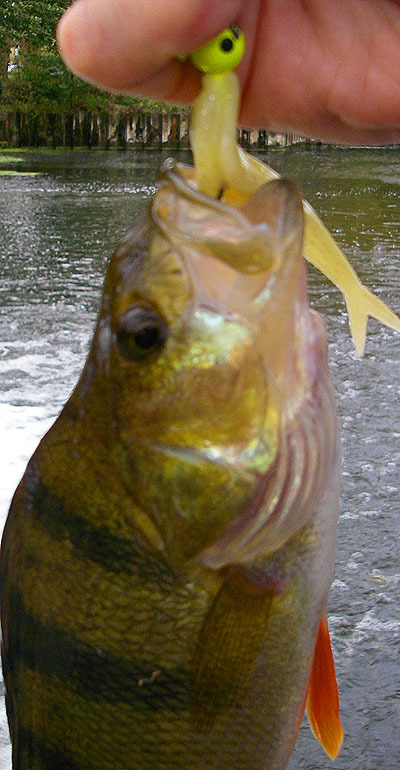 I returned to the place where I'd started and had a couple more perch from the deep water by letting the lure sink for a while. I think that my mistake was not to use the slow sinker from the word go. If I had I expect that the pike would have swallowed it but I might well have caught a lot more perch and possibly even the elusive chub.